4/16/2018 – The Week Ahead: Fire and Ice! 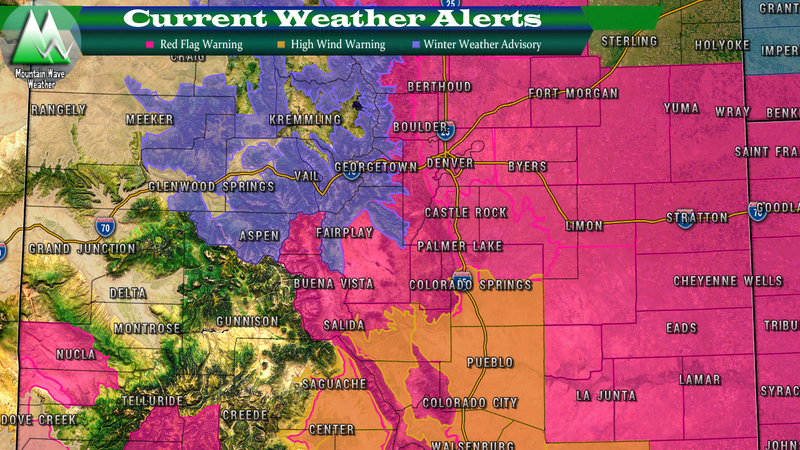 There’s a lot going on weather-wise across Colorado today and many areas have weather warnings and alerts up. Without too much blather and further ado; here’s the latest! rapid fire growth. Extreme fire behavior is possible. days. Use extreme caution with anything that may produce a spark. to high profile or light weight vehicles. as high as 50 mph will cause areas of blowing and drifting snow. As always, you can see Castle Rock specific weather warnings here! All in all it will be a very busy day for weather watchers and meteorologists across Colorado. Strong winds and low humidity will mean nearly all of Eastern Colorado will be under the gun for extreme fire conditions. Meanwhile a strong storm system to the North of Colorado will usher in moisture to the mountains, that combined with strong winds will mean tricky travel conditions late Thursday and most of the day Friday. This storm system will impact Denver and the Palmer Divide to some degree on Friday, not seeing a ton of moisture with it but winds will continue to be strong on Friday coupled with a cold front that will drastically drop temperatures. Look for an update on that storm system later today!